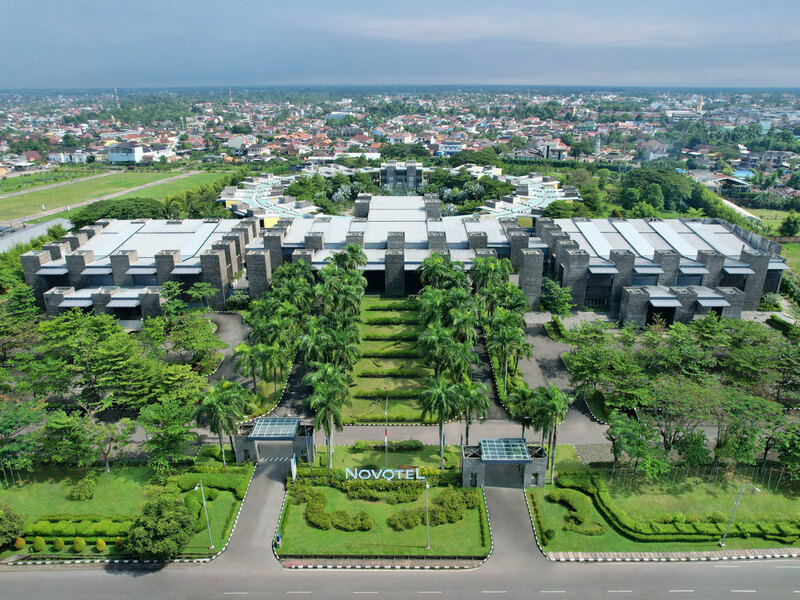 Make yourself at home at the 4-star Novotel Palembang Hotel & Residence in the heart of the city. Explore the local designer stores then relax in the outdoor pool or let off steam at the fitness centre or the jogging track. Fully equipped meeting rooms and the Grand Ballroom provide the perfect setting for all your business events at Novotel. Located at our spacious lobby area, the bar serves cocktails, wine, beer and snacks with live music and a very cozy atmosphere. Overlooking our beautiful outdoor swimming pool, the bar serves delightful finger food meals and tropical cocktails. Actually for room good ya, so big. But little dirty in outside - balcon/terrace. Staff are friendly, helpfull and nice. Breakfast not satisfice - not good for variant and taste. Please more improvelly in breakfast/food, cleaning, and staff in restaurant more attractive. Thanks. The room is clean and cozy, the services are very good. Some furniture needs repairs. The room very clean to stay 3 nights. Hospitality and fast respon to customer. Excellent and sprawling property with enough amenities. Thoroughly enjoyed my stay for 9 days at the Hotel. Room was cosy and comfortable, room service was excellent and food was delicious. Huge buffet spread for breakfast. Overall, I had a good time at the hotel. Would like to stay here only on my revisit to Palembang. Dear Adventure68091552471, Thank you for taking your time to complete this review in Tripadvisor during your recent stay with us. We all delighted to hear that you really had a memorable stay with us and look forward to welcoming you back to Novotel Palembang Hotel & Residence on your next visit to the city. Good overall. Everything worked and room was quiet. Good breakfast and helpful staff. Large parking space is available for guests. Pool was very good with good service. Will stay here the next time we visit. Dear Camper65428028543, Thank you for taking your time to exchange this review in Tripadvisor during your recent stay with us. We all delighted to hear that you enjoyed your stay with us and had a memorable experience and We can't wait to welcoming you back to Novotel Palembang Hotel & Residence on your next visit to the city. We choosing to stay in novotel hotel because the ambient so feels like home &quot;homey&quot;. For my family novotel view is wonderful. Thanks Novotel Palembang. I'm happy and satisfied. Overall.. Excellent hotel except a lot of mosquito in the room. Large area, warm greeting, warm officers, large room, large bed, large bathroom space, clean, nice air conditioner, lots green view around hotel. still the extraordinary one. keep it up. service, complimentary, greeting, food, cleaness, the hotel squad, pool, green familiarities environtment, architecture, i love everything in this residence. novotel palembang still the extraordinary one. keep it up.